I really want to try to blog as often as possible but on the other side there are so many things to do over here and after all, I’m on vacation so I think once every 3 days is more than fine 🙂 Let’s start by saying that I’m enjoying myself and Rj isn’t complaining either. Most of you probably already know I busted the $3k pretty early yesterday but that didn’t ruin my mood at all. I’ll just start from the beginning, which is of course day 1. I’m doubting between being very detailed about what happened (i.e. I had 78s on a K94 board) or keep it very high level (i.e. I played super but got unlucky). The first might be fun to read for the poker players among the readers but in the end the only hands I want to tell are beats 😉 I always just start typing and see where it goes, I’m even curious myself. I’ll add some pictures to not only tell but also make it visible what is happening over here. My daily routine in Las Vegas almost always starts with going to the Subway and the next thing is going to the Pool. Rj can’t sit still for very long but I gave him a book (he never read books): ‘The Professor, The Banker and the Suicide King’, the well known story about Andy Beal vs the Corporation. I’m reading a book myself as well: ‘Fooled by randomness’ and it’s really a nice read. 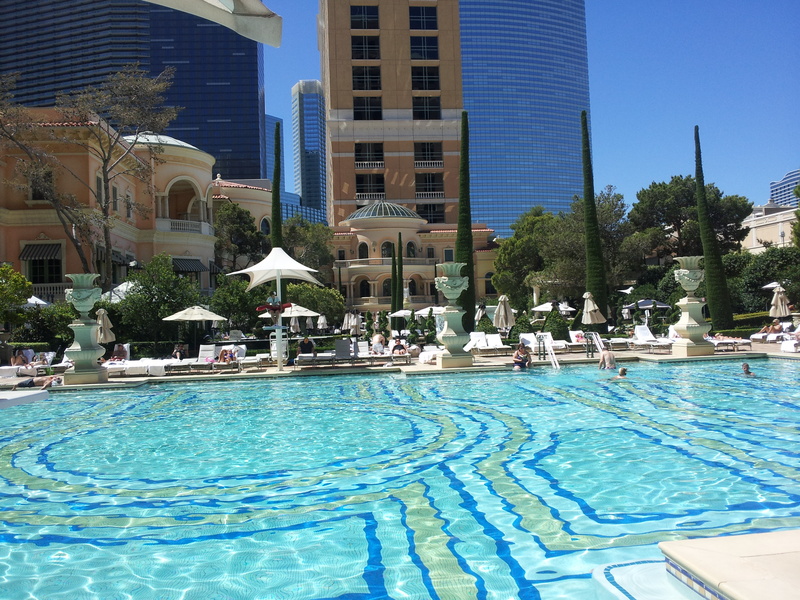 I could go on vacation and spent every day at the pool or beach but that’s of course not the reason I went to Las Vegas but it’s an option and just as comfortable (not in July/August when it’s too hot) then doing it in Spain or Greece. Many people don’t see Las Vegas that way, but I see it as the town with the perfect mix of things I love to do. After I did my daily routine I went over to the Rio. I’ve seen it before but it still looks awesome when you walk into the poker room. There are 2 big rooms and it’s just packed with people. 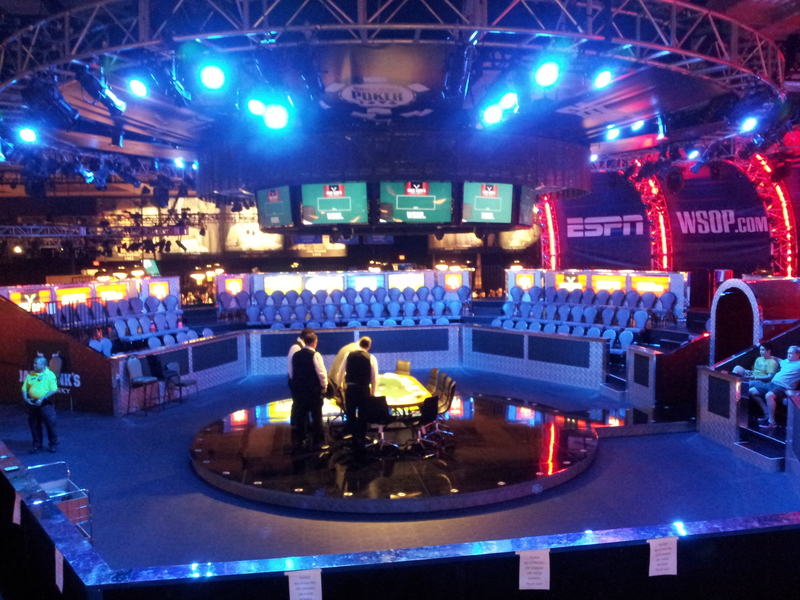 Now they’ve also changed the stage where the final tables are held. It really looks amazing, unfortunately poker isn’t really a stadium sport so it’s not like there are hundreds of people that go watch the final table of these preliminary events but it’s still a nice view. At 17:00 the $3.000 Limit Hold’em event started. I walked over to my table and didn’t recognize anybody, that’s normally a good sign but since I’ve hardly played any live tournaments outside the Netherlands so it doesn’t really mean much. More people sat down and they all knew each other. When the table was full there where 7 people who knew each other which can happen of course and isn’t particular special. The funny thing was however that most of these people knew each other because they all played LHE cashgames in California, in other words they were are LHE Poker pro’s. Now I thought LHE was a dying game, since most people play NL, PLO or maybe Mixed games but these players often didn’t even like the other games. I didn’t know this at the start of the day but it was already pretty obvious early on. Nobody limped during the first 4 levels and the first guy who limped, limped KK UTG which made perfect sense at that time. Everybody was so shocked that he limped and tried to isolate him, so he got a lot of value out of his hand that way. I wasn’t sure if I would like playing a LHE Live tournament but I loved it. It plays so much faster than NL and the action goes so fast that there is never a boring moment. In NL people often need 2 minutes pre-flop to decide to play their hand or not which is ridiculous. Sure it makes perfect sense post-flop or when you are 3-betting or 3-betted but in LHE everything goes within split seconds and that’s the way I like it. Everybody played as they looked so the young Asian guys played to loose, the two old men played tight and the loud American tilted every time he got rivered. The people who played too loose where all behind me so unfortunately I couldn’t profit to much of them. I had 2 tight players to my right so that wasn’t really great but I still think I had an edge on this table. Maybe not a big one and others at my table might think the opposite but at least it felt a lot different than the PCA and WSOP ME (NL events) in which I had a pretty unlucky table draw as well and didn’t really feel like I had an edge. Being confident about your play is something you need to play good and if you think you have an edge it helps a lot to feel confident. I either won small pots at showdown or without showdown and lost all big pots with Kings, set of Aces and a set of Fives. Unfortunate but not really bad beats as my opponents always had valid hands so typically Limit. We played 8 levels with a starting stack of 9.000 and the 8th level we played 300/500 blinds which means betting 500 postflop/flop and 1.000 turn/river. People starting busting pretty fast and I was almost out but run my stack up till 15k to finish the day with a just below average stack. I think I didn’t miss a single spot in which I could have opened or 3-bet and might have cost myself 3 unnecessary bets all early game when the stakes where still low. Day 2 started at 15:00 and it was clear to everybody that you needed some good hands to advance since we played 600/1.200 (300/600 blinds) which means the shorties can only play hands in which they are almost always showdown bound. I had Patrick Renkers (Shevmouse) behind me and that was the only player I knew at my table. I picked up the blinds with AQ, the next hand I 3-bet and win the pot after my opponent folded the river (so nobody saw my hand) and then find Kings, how good can you start? I 3-bet again and obviously I look really aggressive to the table but unfortunately I lose the minimum on an ace high board. Bleh! My image is set so that means I’ll have to adjust my play a little. I keep getting good hands and 3-bet again with AK a little later and Patrick 4-bets. We see a 234 flop 3-way and it goes check/check/bet/call/call. The turn is a 3 and it goes check/check/bet/call/call again and the river is an A, sweet! The 3th player donkbets, I call and Patrick folds and I obviously lose against fives, we both got screwed. Patrick got 1.800 left and opens a little later and I find ATs to put him all-in. I lose AT vs AK and I’m suddenly down to 4/5k, ouch. I open 3’s, flop a set and get maximum value by check/raising the turn. I win another pot and I’m back at 13k or so. Patrick busts and I keep getting good hands to open. Most people probably were thinking I was playing way to aggressive but I wasn’t really. I open K8 at the button and the small blind 3-bets. The flop comes K high and I decide to play call/call/call. I like my flop/turn call but I definitely should have raised the river. That was probably my only mistake of Day 2 but I ended up losing the pot vs a set of kings so I can’t say I didn’t like my error 🙂 The next hand I get TT, how good can it get? I open, the button (the SB from the previous hand) cold calls and the big blind 3-bets. 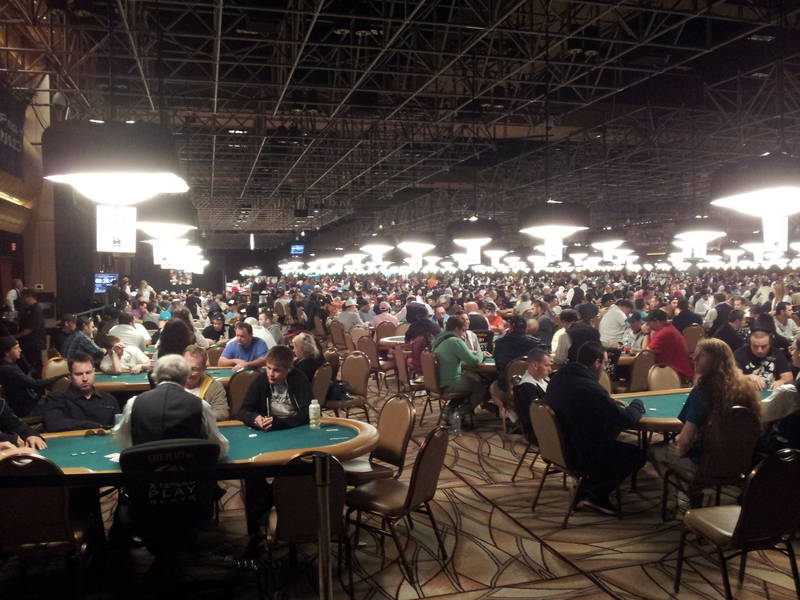 I 4-bet and we see a 984hh flop. I bet, the button raises the bb folds, I 3-bet and the button 4-bets, wowie. The turn is a 3, it goes check/call and the river a Th. I got less than 2 bets left, I check/raise all-in and expect to win the hand, lucky river! He says straight flush and I say goodbye to the table. I was really happy with my play of both days, especially day 2. I enjoyed every second of the tournament but wasn’t lucky enough to cash or win, that’s poker. I did an interview with Remko (It’s in Dutch and you can find it here) and could only think about playing the $10.000 event next week. I’m really looking forward to it already, especially because since we are deeper you can take a little more beats before you bust. Rj just busted before me when he hit a queen on the flop and gets it in vs 7’s and loses. We agreed to go to the Naked Fish later on with Remko and Frank (For the non-Dutchies, the Pokernews NL Reporters) and go over to the Palms to watch Thor, one of the newest Marvel Movies. I would highly recommend it to anybody as it was a great movie and Nathalie Portman was again the cutest girl in the world! So, Naked Fish it is…. I read many stories about it but I don’t have many friends who like Sushi so this was my 4th or 5th time I eat Sushi and my first time in Las Vegas. We had a group of 8 people since RJ and I actually tagged along with the diner arrangements Frank and Remko made earlier with Pascal. I knew Pascal from the day I busted the WSOP 2009 Main Event and it was really a coincidence that we met again. Pascal was with his girlfriend and two others guys (Alje and Dirk) which both were in Vegas for the first time. The Sushi mania could start and I asked Remko what I was eating just so I knew that if I didn’t like it I wouldn’t stick it in my mouth the next time. I think we had 9 different rolls and there wasn’t one I didn’t like, I loved most of them but couldn’t tell you anymore which I liked the most. I just tag along with Remko and Frank next time again since they don’t even have to look at the menu anymore to order. Later on Rob, Remco and his girlfriend joined us as well and Remko and Frank had to go back to the Rio to do some work again. Remco is a big fan of the piano bar in the New York, New York. He only goes there 5 times a week and sings along with every song. That sounded like a great idea to everybody so it was time for some fun. Now the Piano bar isn’t the kind of place where you get a table and do bottled service but I prefer pouring my own drinks over going to the bar every time in a packed place and wait 5 minutes for your drink. The price for a bottle of wodka wasn’t really shocking either and since we ordered a bottle we also got the best seats in the house so it was actually a great deal where normally you could say you need to be a baller (or want to pretend to be a baller) to do this. 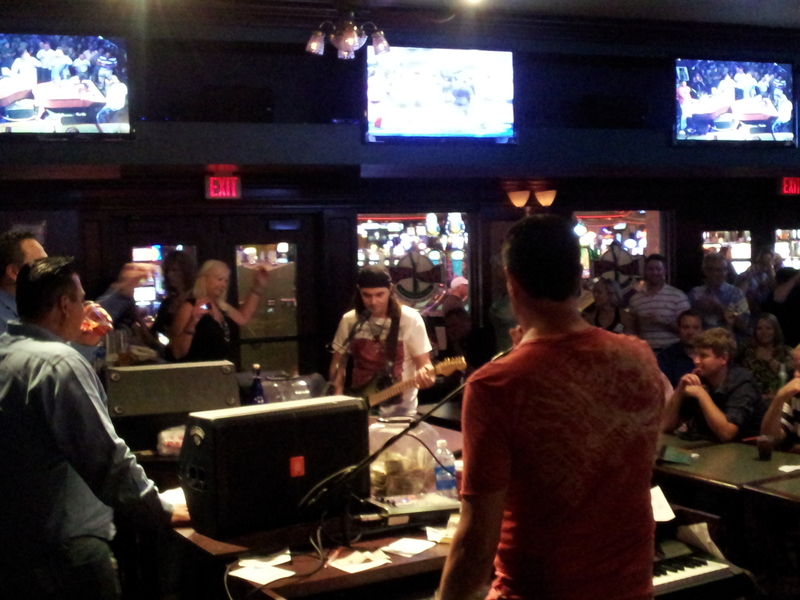 2 guys at 2 pianos and the more you pay, the quicker they play your song. Now the place was filled with people who loved country songs, ouch! 1 song is fun, 2 songs is doable but after 5 songs you wish you were dead! In Las Vegas there is nothing money can’t fix and luckily we were not the only ones he wanted some different music. I didn’t request a song the whole evening but the average amount that was given for a song was about $20, not bad for playing a song for 3/4 minutes. Everybody was enjoying themselves, we got a bit tipsy, a bit louder and eventually a bit drunk. Luckily the place closes at 2:00 since I have the nasty habit to always keep drinking and by then I already had enough. Just a diner which turned out to be not only a nice diner but a fun evening out! Of course this morning I was hungover. Still the routine started with a Subway, RJ needed some jeans so we did some shopping and the rest of the day we chilled at the pool. Lovely! I’m now going to hit the shower, get a big steak and probably play some poker unless somebody comes with a better plan (I know many but I need some money to fund the next trip to Las Vegas!) Wednesday I play the $10.000 LHE, I’ll probably blog again on Monday/Tuesday depending on what goes on during the weekend.